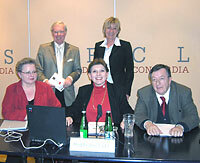 Seated: IPJ director Abu-Fadil flanked by Ms. Gudrun Harrer, of Austria’s daily Der Standard and Mr. Georg Hoffmann-Ostenhof of Profil magazine; IPI Director Johann Fritz and Pressclub Concordia’s Secretary General Dr. Ilse Brandner-Radinger look on. IPJ director Magda Abu-Fadil told a capacity crowd at Vienna’s Pressclub Concordia [program] that Lebanon was not Ukraine or Georgia and that its “independence intifada” should be viewed in the proper context. In a lecture entitled “The Cedar Revolution: Events in Lebanon and their Effect on Democracy in the Middle East,” at the invitation of the Vienna-based International Press Institute, Abu-Fadil presented a tour d’horizon of the unfolding Lebanese story since the assassination of former prime minister Rafic Hariri, noting that the ensuing uprising was home grown. She said that conclusions about events in Lebanon being the result of the push for freedom and democracy in the Middle East were misleading since Lebanon had enjoyed a multi-party political system and free press since its independence from French mandate rule in the 1940s, which had made it the envy of neighbors. These events dovetailed with very vocal debate about the almost three-decade presence of Syrian forces and intelligence services in Lebanon, which was daily fodder for various local and regional media and intense international press scrutiny, as well as mounting pressure from the international community for a Syrian troop withdrawal. The lecture/visual presentation was followed by an interview segment conducted by Ms. Gudrun Harrer, foreign editor of the Austrian daily Der Standard, and the foreign editor of the Austrian magazine Profil, Mr. Georg Hoffmann-Ostenhof, who then turned it into a lively question-and-answer session about legislative elections in Lebanon, the disarming of all militias in the country and the international investigation into the Hariri murder. The event was attended by Arab diplomats, including Lebanon’s ambassador to Austria, H.E. Samir Chamma, academics, members of Austrian and Arab media, officials of international organizations based in Vienna and Arabs living in the Austrian capital.